Dobermans have been part of my life since 1978 and part of Bob’s life since 1985. This adventure started with a black and tan girl we called Aja (sadly, I do not recall her registered name). She was a wonderful, well behaved girl, and adjusted very well with our Sheltie, but sadly we lost Aja at the young age of 4 to DCM, sudden death. Tiersa (Dreams of a Child) was brought home when my son was only 4, in 1983, and that laid the course for an inseparable friendship. At 9.5 yrs Tiersa’s “arthritis” had gone beyond control and we had to make the decision to stop the pain and discomfort. Reflecting back on her deterioration, I can comfortably say that Tiersa had sadly succumbed to CVI (wobblers). Brokenhearted, we decided to welcome a GSD to our family. Brawnson was a happy go lucky galoot who loved everyone and gently chased butterflies! In his 9th year, he sailed to the Bahamas as 1st mate, but yet again, we lost our beloved companion before the age of 10, this time with cancer. We told ourselves he loved the Bahamas so much that he decided to stay. Now to 2004, when Tasman, Liberator’s Tasmanian Devil was born, and so began the new journey in the world of conformation, and competitive obedience. I had always put the basic obedience training on my dogs, but didn’t even know about competitive obedience until then! Pat Blenkey showed Tasman to his CKC championship. I started in the UKC ring, unknowingly putting him in 2nd place in Dobermans (the UKC includes both Canada and the USA). So, the next year he became No. 1 and won the breed at the Prestigious UKC Top 20 and Premiere! With confidence and several UKC BIS under our belt, off to the AKC ring we go. We finished with 3 majors! Tasman achieved his CD in both CKC and AKC, as well as his RA on both sides of the border. He was a certified Therapy Dog, and my heart dog! Then in 2013 he turned 9 ☹ On route to the border, heading to Florida for the winter, Tasman laid down in the back of the truck, not to awaken again. 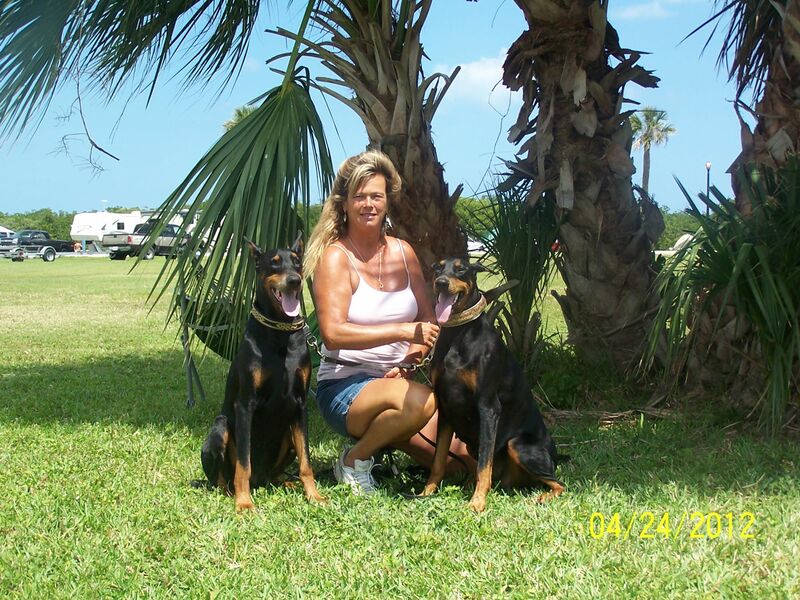 In 2010, we had brought Charo, Liberator’s Obsession, home at the age of 7 months, and Charo and Tasman quickly became best friends and the best pair of Dobermans anyone could ever ask for. I titled Charo in CKC, UKC, ABI and AKC – obviously hooked on conformation! She was my first CKC BIS and BISS dog. She has trialed once for her CD and therefore has one leg. We hope to complete her CD in the near future. She also has her RN in AKC. In 2015 we were blessed to be able to co-breed and whelp a litter with Wrath-Liberator Dobermans, in which I will be forever grateful for making this dream come true! From this litter, we kept the infamous bad red head, Nugget, BIS, MBISS, BILBS Gr Ch Liberator’s Goldsail v DreamOn, WAC. Nugget was my second dog to title in CKC and will hopefully be my 3rd AKC Champion (she is major pointed). She has also achieved three specialty wins, Best in Show, and Best Bred by in Show, at quite an early age and extremely limited showing. She has also earned her WAC before two years old, so we will go on to some obedience in the future. Needless to say we are very proud of this little girl. You can see that we have been very fortunate to be part of the Wrath-Liberator family since 2004. Pat and Brian have been very supportive throughout the years, in which none of these accomplishments could have happened with out them. I am forever indebted to them and want to acknowledge and thank them for all they have done for us, and of course for the wonderful Liberator dogs we have had in our life. 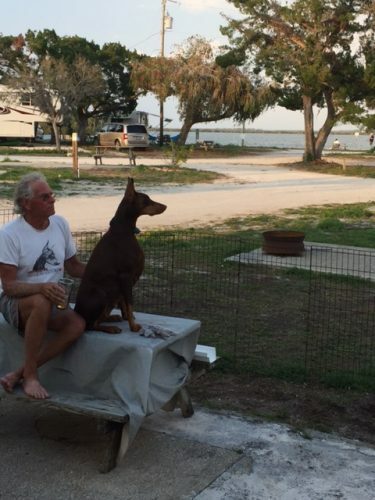 We live in the country, and our dogs travel with us everywhere: winters in Florida, summer adventures in the boat. They live in the house with us and share every part of our day. Along with working, playing and sharing our lives with our dogs, I have also completed several courses and seminars in Dog Behavior, First Aid, Genetics, and Reproduction. As for my kennel name, well, I have always dreamed of sailing the Caribbean. As luck would have it, In 1996 we purchased a 30′ Nonsuch that was lying in Grenada; her name was Dream On! In December of 1997, Bob and I left the safe harbor of Prickley Bay and sailed through the Caribbean to Florida. A trip of a life time and a Dream come true! Along with my love of the sea, I also dreamed of breeding the lovely Doberman Pinscher, hence the correlation to our kennel name. Dream until your dreams come true!! So that is a bit of my “dog history”. Welcome to our world!